I thought it was time to say some more about growing up in the Como area of St. Paul. 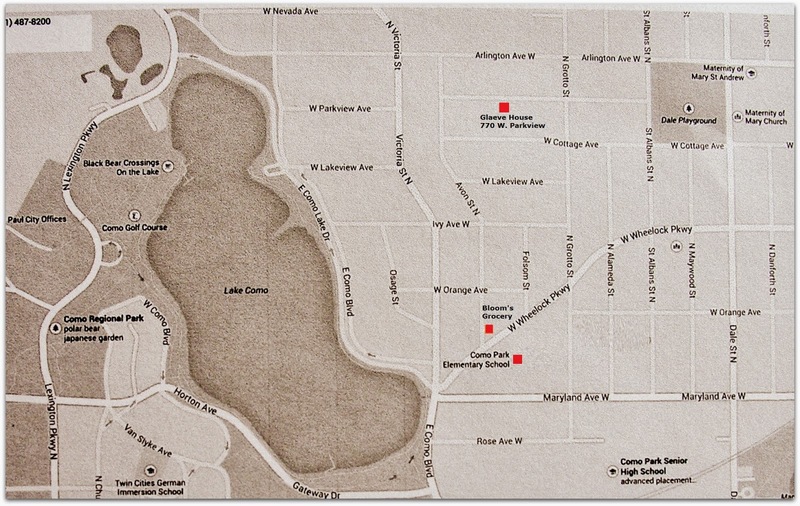 I have written previously (see that here) about the first house my family owned on Parkway Drive and the move to the house in the Como area on Parkview Avenue. Officially, the Como neighborhood is bounded by Falcon Heights and Roseville on the North, the Railway on the South, Dale Street on East and Snelling Avenue on the West. My neighborhood during elementary school years was more restricted. I was allowed to wander as far east as Dale Street with it's playground. There was small basement grocery store on the corner of Arlington and Dale, the Ardale, where I was often sent for bread and milk. My southern limit was Maryland and when I started going to confirmation classes at The Lutheran Church of the Redeemer on Carroll and Dale I needed to walk to the very edge of my world to catch the streetcar. The tracks began at Dale and Maryland. Though we were allowed to go north of Arlington to Larpenteur, we knew there were only houses and thus seldom ventured in that direction. It was the lake, the park or the zoo that received most of our attention. And there weren't any restrictions as long as the chores were done and we were home at the appointed time. Fishing poles in the summer with brown bag lunches stuck in the bicycle saddle bags, hockey skates and sticks slung over our shoulders in the winter, and we would head west. Everything was free, no admission fees period. I know it was one of the best possible places to grow up. Those were great times and I have good memories. 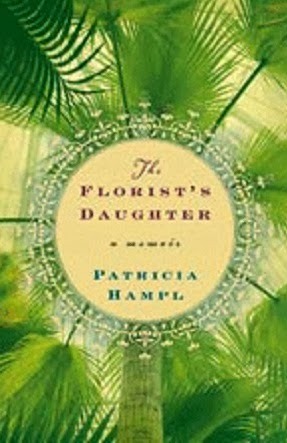 Patricia Hampl, one of my favorite St. Paul writers, makes a distinction between the Upper Midwest and that other Midwest in her book The Florist's Daughter. "For we didn't just live in the Midwest--ours was the Upper Midwest, as if we had bypassed the regular Midwest and achieved a Siberian ascendancy that gave us a transcendent existence amid the boreal forests and silent stars." Now, how's that for making you feel special. Yes, the winters lasted half the year and the snow kept coming until there was no place to put it, but that's also part of what made the place and us, special. In Minnesota, before the days of “wind-chill”, it was either cold or colder. When you gasped for breath when walking into the wind it was cold, when you couldn’t breathe until you put your nose into your mitten, it was colder. These days even Garrison Keillor is talking about "wind-chill". What's up with that? He grew up here and should know that "wind-chill" was never in our vocabulary. True Minnesotans still bristle at this foreign concept. Also, none of this snow accumulation nonsense. It was either a lot of snow this year or not as much as usual. No body went out with a ruler to measure the snow. 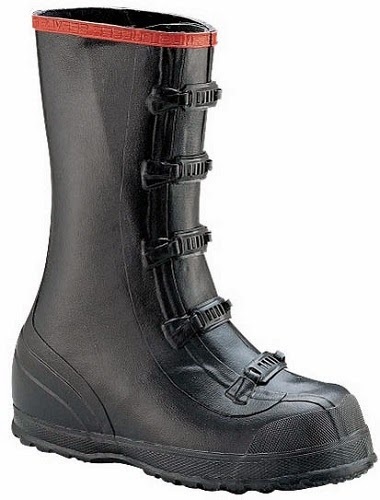 Winter was here when the snow was over your black high topped tennis shoes. Only then was it time to dig out the 5 buckle boots, hoping that a mouse wasn't resident and that the buckles hadn't rusted shut. We walked those six blocks to school in adventure, often seeking out the largest snow bank to conquer. No snow days or ice days and therefore no TV scrolling to check for closings. School happened. It never didn't happen. When you got to school, boots were removed, often with the help of a friend pulling and the wearer pushing. They were placed on the floor under the assigned wall hook which now held your winter parka with wet mittens stuffed in the pockets, and a scarf, if you hadn't been able to get out of the house fast enough before your mother reminded you not to forget your scarf. Timing was everything. The journey was repeated at lunch time for those of us who lived on the south side of Arlington Avenue. The classmates who lived on the north side of Arlington had to unwrap their PB and J or baloney sandwiches and missed out on the noon adventure. Lunch at home meant hot soup and often fresh chocolate chip cookies still warm and gooey. The mothers were all there waiting for their darlings before commencing afternoon canasta games or shopping trips to the Golden Rule or Emporium department stores. This was long before the need for two family incomes. The "No wife of mine is ever going to work" rule was still in effect. This too did pass. We weren't aware that the architectural style of our school was Beaux Art, but nowadays it makes one proud that someone cared enough about the room where we unrolled our nap rugs to design it with such elan. If I had only known, things may have turned out much differently. I probably would have taken Latin in high school and who knows, maybe even French, though I think I would've been the only boy in the class. 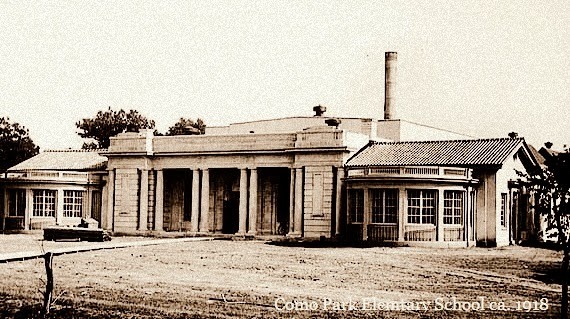 They have messed with everything surrounding Como Park Elementary School, but the original building is still the anchor. I can only hope the interior is much the same, and if it is not, please don't say anything. The recess area, where our ball games were played and where the bookmobile parked, is now a parking lot. On the other side, the Middle School now sits where the monkey bars provided a macho proving ground, a few cracked teeth and broken arms. 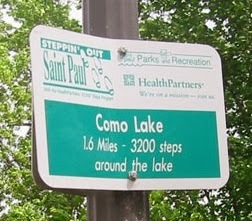 Como Lake and the path that encircles it. Now they have "step" markers so you can chart your progress toward a healthy heart. Our breathing would slow when we spotted a bull frog near the path. We attempted, with great stealth, to add it to our collection. Thus our path was marked by our successes and failures not some crazy "step" markers. Bloom's Grocery was directly across Wheelock Parkway from the school. It was there that we bought our baseball bubble gum cards, trading two New York Yankees for a Brooklyn Dodger any day. 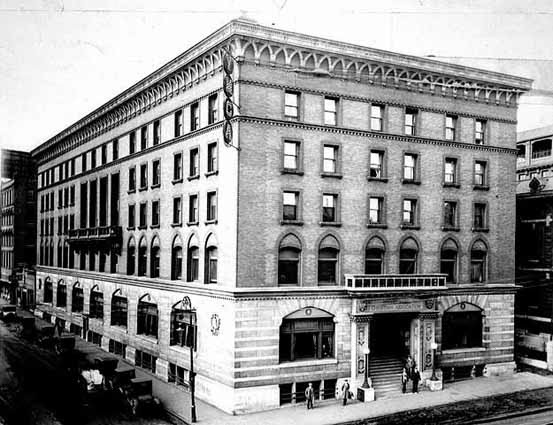 The building, now sans store windows is an eye sore as it has been converted to a multiple residence. Better to survive only in the memory rather than suffer such an ignoble fate. 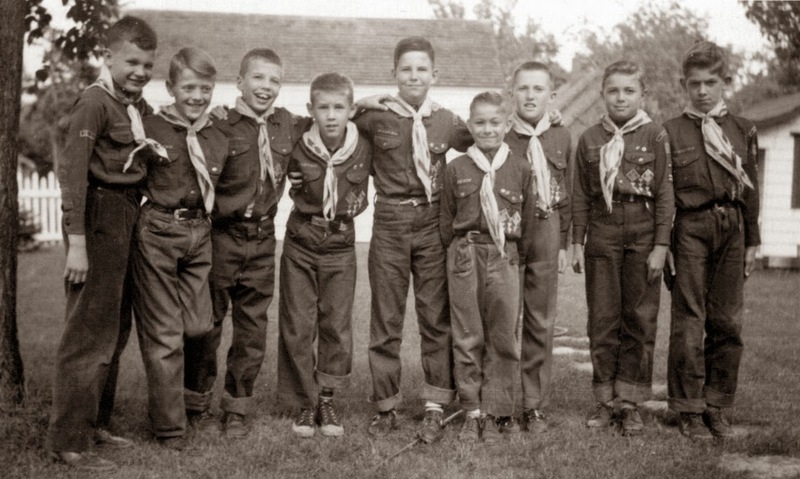 For me, A big part of the years 1948 thru 1951 was the Cub Scouts. Our Cub Scout Den mother was Margaret Kuettner, wife of George F. Kuettner Sr. and mother to George Jr., Mary Ann, my friend Bruce, and Phyllis. We usually met in the basement of the Kuettner House on Victoria Avenue, not far from the school. Mrs. Kuettner always had craft projects, games, and often treats. Bruce's father, George, was active in the St. Paul Turners, a German fitness organization. On a number of occasions, he took us to their building to try out the various gymnastic apparatus. After the first night I knew gymnastics wasn't in my future. Both Bruce and Jim Flueck, however, continued in gymnastics. 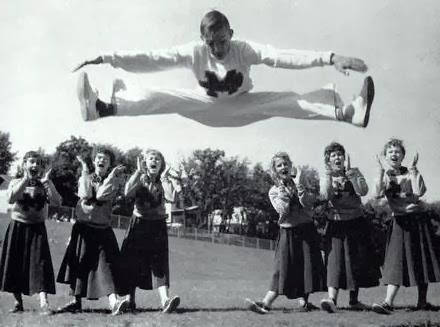 Bruce Kuettner as Cheerleader at Murray High. Bruce Kuettner excelled and was a cheerleader and gymnast at both Murray High School and the University of Minnesota. He eventually graduated from St. Cloud State University, and was employed by the St. Paul School system as a teacher, and a coach. He passed on in May of 2013, finally succumbing to a life long battle with childhood diabetes. I have tried to track some of the other Cub Scouts without much luck. Jim Flueck, after medical school, became an Endocrinologist residing in Lexington, Kentucky. I think Jack Hawley moved out East. Bucky Henderson's family moved to Mounds View where he attended high school. Duane Grahn is listed as deceased in 1998 in Hennepin County. I have no idea what happened to Bruce Geske, Robert Hanafin or Robert Nelson. Carnival. The ice palace, an ice sculpture competition, the coronation of the Queen of Snows, the parade, the treasure hunt, ski jump competitions and many other Chamber of Commerce events which were held so you wouldn't feel bad that you couldn't afford to winter in Florida. Some of the Winter Carnival events were held on Lake Como, near our house, including the national speed skating races. Many of the skaters entered were Como Park regulars. They represented local speed skating clubs. 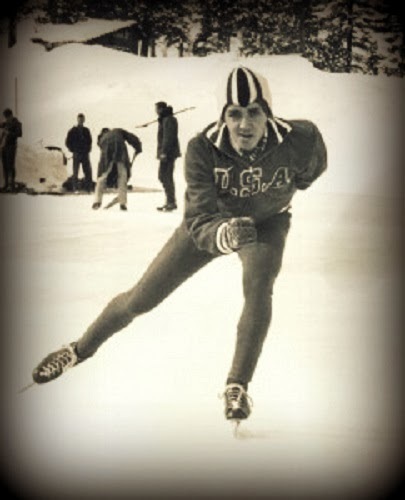 My local speed-skating hero was Floyd Bedbury. In the mid-50's, he was always there and competing. Even though I watched many of the races, I would check out the results in the Sunday paper. Recently I read In the St. Paul paper of the death of Floyd in 2011. "Floyd Bedbury, two time Olympian, head coach of the Twin City Speed skating Club, and tireless advocate of our sport, passed away... His wife Janet was at his side. Over the years, many local speed skaters from every club benefited from his coaching expertise, as he never turned down a skater’s request for technical help." He died of cancer at age 73. Here's to you Floyd Bedbury. Thanks for the memories. Another popular Carnival event on the lake was the Mutt Races. Any boy or girl with a dog could register and enter. Nothing fancy, just the family dog hooked up to a sled. The track was quite long and folks were positioned along the route cheering on their favorites. 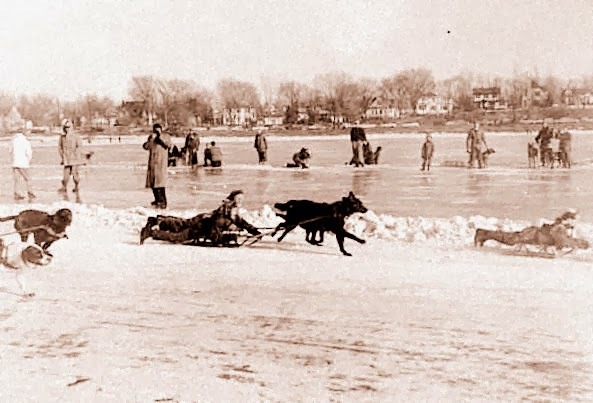 Some form of these races started around the turn of the century and may still continue as part of Saint Paul's celebration of winter. At least one year my friend Ronnie Schultz was entered with the family dog, Ginger. 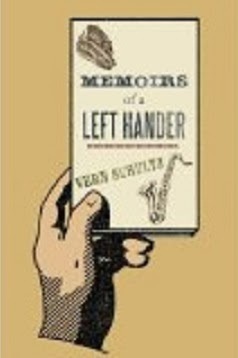 Vern Schultz mentions his brother Ronnie and Ginger's race in his book, Memoir of a Left Hander. I don't remember that Ronnie won the race, as reported by Vern, but it doesn't surprise me and it certainly makes for the best story. Vern Schultz was the 2nd son of Fleurina and Arthur (Art) Schultz. Art was my Dad's boss at the old St. Paul Fire Department Repair shop on the corner of Rice and Arlington. I think I met Vern a couple of times at the family home but he was 12 years older and by that time already teaching and coaching at St. Agnes. His brother Ronnie was 10 years his junior and closer to my age. Ronnie and I knew each other from hockey at Lake Como and thought it quite cool that our dads worked together. 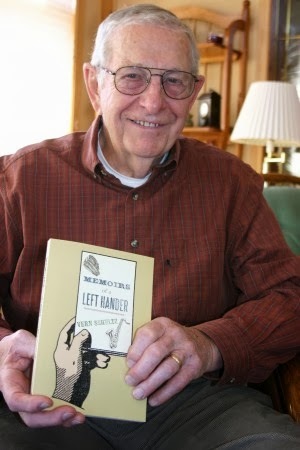 In Vern's book, Memoir of a Left Hander, he tells of growing up in St. Paul's Frogtown neighborhood. He says it was the perfect neighborhood for a young kid. It was near the playground, the Dairy Queen, and the White Castle Hamburger stand where he ate more than his share of the little trademark square burgers. When Ronnie was born, the family decided on the move to Como though the house they purchased wasn't much bigger than the one they were leaving. Vern never seemed to make the adjustment to the new neighborhood. He faults weak ankles as a factor in his not fitting in. The Como Park kid culture demanded a religious focus on ice hockey and your ankles needed to be strong enough to hold up through a long after school pick-up game. 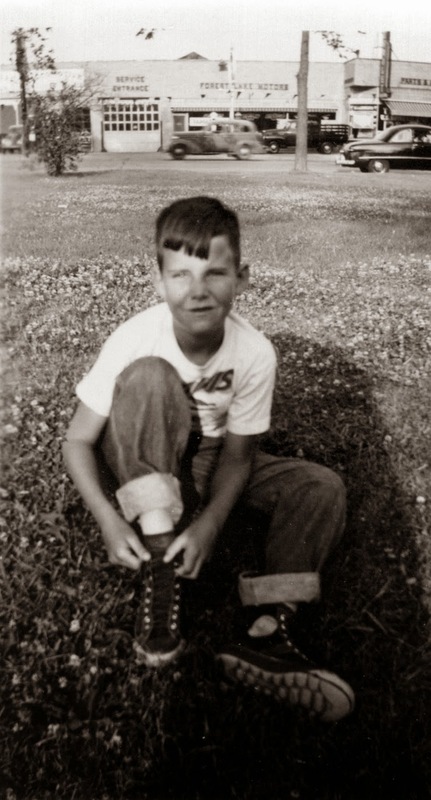 I especially liked Vern's recollections as a young boy of 12 or 13, working at the Lexington Ball Park. 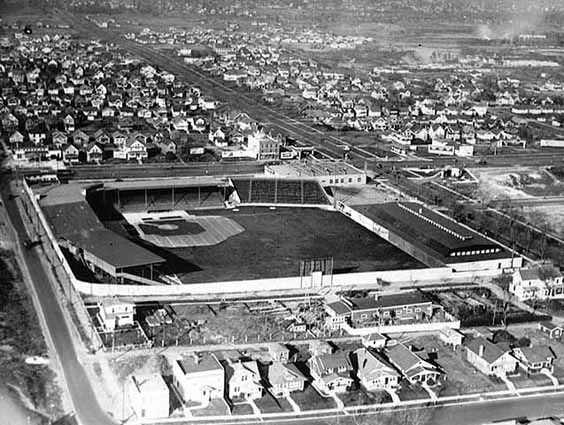 We watched many games there, in the left field bleachers, as members of the "knothole" gang. Sometimes we went as Cub Scouts, but often some of the kids in the Parkview neighborhood would talk an adult into giving us a ride. I think the only membership requirement for the "knothole gang" was the price of admission, 25 cents. 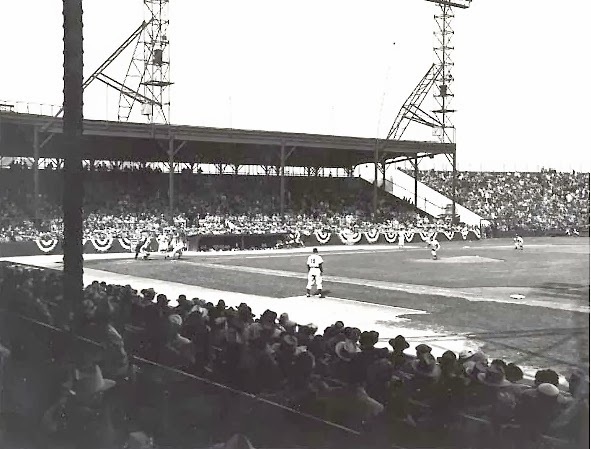 It was fun to scurry after the home runs and foul balls, but in those days you didn't get to keep the ball. An usher or ball boy would demand that you turn it in, to be put back in play, scuffed or not. We cheered on the hometown Saint Paul Saints and booed especially loud when the Minneapolis Millers came to town. 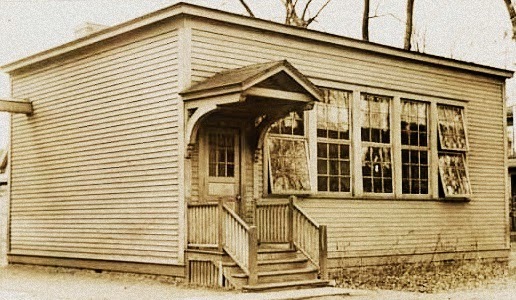 Early View of the St. Paul Y.M.C.A. building on Cedar St.
During those years, many of my hours were spent at the St. Paul Y.M.C.A. When folks would ask what I wanted to be when I grew up, my most frequent answer was that I was going to work for the Y. Could there be anything better than playing pool, shooting baskets and swimming all day. 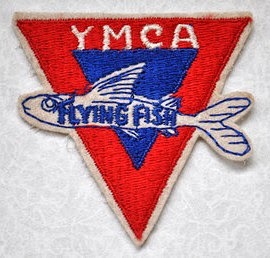 Progress in the Y's swimming program was made, as I progressed from minnow to fish, to flying fish, and began training for a Life-Saving certification. During the summer of 1950, as part of the YMCA Summer Fun Club, tours were taken of various historic sites around the city. We went on a field trip every day; to Fort Snelling, the Sibley house, the Gibbs Museum, and many more. My favorite was our trip to the Coca Cola plant. It was fun to watch the assembly line where bottles were shot with Coke, capped and run along the track for boxing and stacking. The only human in the room was someone in a white coat who was making sure the machines kept running. I thought if I didn't get the Y job, maybe I could apply for the white coat job. Polio was rampant during those years. For me, it probably had something to do with the Y pool. This was before the Salk Vaccine. The disease would put me at home in bed, under heat lamps and heating pads for a good part of the 5th grade. The treatment, at the time, was massage and water exercise and heat. The upside was that I no longer had to read under the covers by flashlight as the light was always on. The downside was that the light was always on. I was one of the lucky ones who emerged after treatment with minimal paralysis and the ability to do almost everything. It was also the year my class was in the "Portables". These were temporary rooms placed on a lot behind the main school building. No cloak room, no bubblers, no bathrooms, nothing Beaux Art about it. I also wasn't too keen on my teacher that year. It would have been a good emersion year for the study of developing nations, segregation or 2nd class citizenship. But, the most difficult was staying in bed and missing the neighborhood games. No visitors except immediate family. As it turned out, it was probably the best year to take a sabbatical, stay in bed and catch up on my reading of the Classics. Classic's Illustrated that would have been. Lot's of pictures and not too many words. 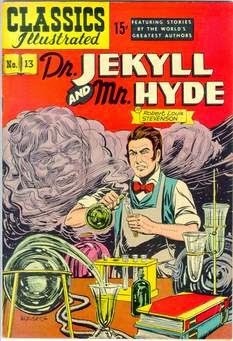 Today they call these books, Graphic Novels but only a fancy label for what we called "comics". Unfortunately, the text books for 5th grade also showed up at bedside. I wasn't excused from homework. 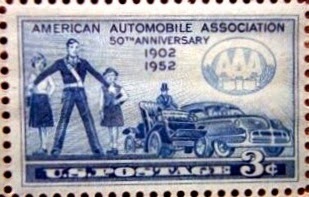 According to the AAA web site, "The national school Crossing Guard movement was the product of the American Automobile Association which started in 1902. For more than fifty years, Patrol Boys and Patrol Girls, worked together to reduce accidents when children crossed the street. The US Postal System dedicated a First Class postage stamp in their honor in 1952." Those of us lucky enough to be chosen as Crossing Guards in the 6th grade, were able to leave class 10 minutes early to assume our positions. We wore leather harness belts, with badges as symbols of our ability to hold up that heavy sign until the last 1st grader had crossed. My usual corner was at Grotto and Wheelock Parkway. It was protection to the max. The highlight of the year for the Crossing Guards was a parade in downtown Saint Paul where banners and marching skills were on display. This was followed by a picnic in one of the nearby parks with fellow Guards from across the city. Free hot dogs and soda and ice cream in a Dixie cup with a wooden spoon. 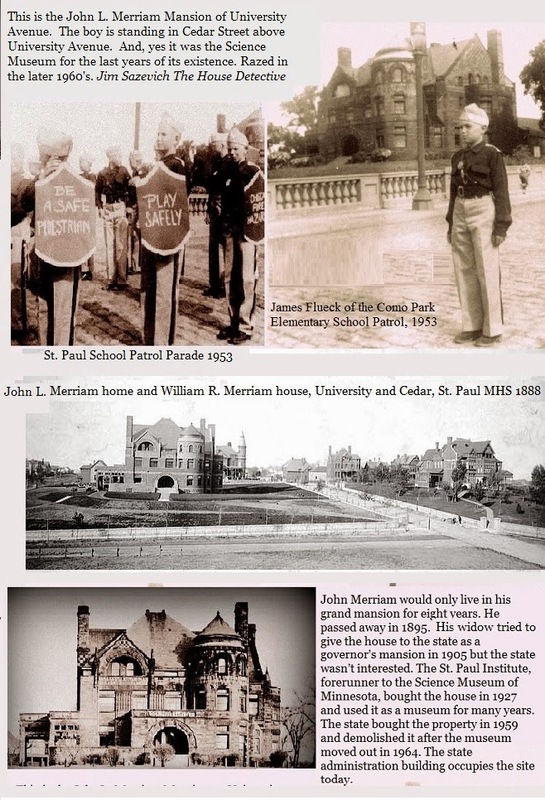 Thanks to some of the good folks on the Facebook site "Old St. Paul" for help in identifying the building that appears in some of the photos of the march in my album. The next year, 7th grade, was at Murray Junior High School which I hope to write about in a future blog. Labels: Como Park, Crossing Guards, Cub Scouts, Frogtown, Lexington Park, Old St. Paul, Polio, Saint Paul MN, Vern Schultz, Winter Carnival, Y.M.C.A.